Have you ever endured that moment in a race where suddenly your legs cannot run any faster? The sensation of defeat overwhelms you, as your pace slows down and the finish line is still miles away. I was hungry for a sizeable PR in my second half marathon, and so I committed the mistake that so many runners make in the half marathon: I started out at too fast of a pace. I crashed and burned. I may have still finished with a decent PR, but I had a miserable second half of the race. I didn’t want to repeat that experience again, especially if I could control it. 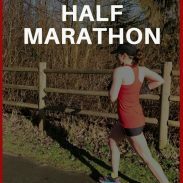 So I did what I naturally do: I read everything I could to find a practical solution to avoid struggling over the second half of the half marathon. 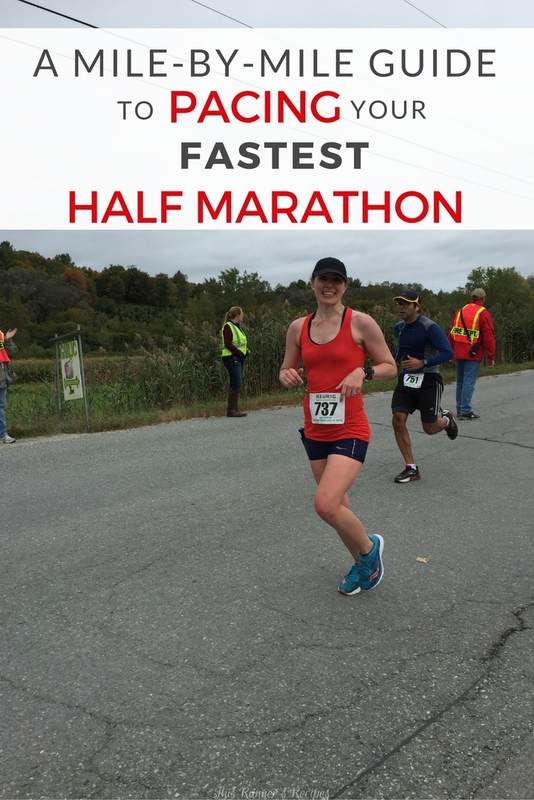 Out of everything I read, Sarah’s post on How to Pace Your Next Marathon or Half Marathon helped me the most (and I’m hoping her advice will help me at CIM!). Last week I wrote about how setting a goal of following a smart pacing strategy can help you shift from focus from finish times and run a breakthrough race. So today I want to share an example of what this type of quantitative goal setting looks like in the half marathon and how to pace your fastest half marathon and enjoy a breakthrough race. Why does pacing matter for the half marathon? Your half marathon pace is not much slower than your lactate (anaerobic) threshold. When you run faster than your lactate threshold, you accumulate fatigue at a much quicker rate than when you run below your lactate threshold. So when you start out a half marathon too fast – faster than goal pace – you fatigue more rapidly than you would at goal pace or slightly slower. That’s why the last 3-5 miles of a half marathon feels so difficult when you do not pace appropriately – you sabotaged your race by starting out too fast. 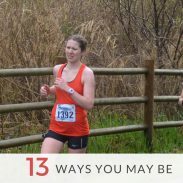 These tips are what I have found that worked for me in running my half marathons – both my PR race at the Lake Sammamish Half Marathon and at the Leaf Peeper Half, where I ran a negative split on a challenging course. Of course, every runner is different, but these guidelines can help you pace your fastest half marathon. Warm up with 5-10 minutes of very easy running, some strides at race pace, and dynamic stretches. Take these miles easy. Even if you warmed up before the race, most of us still take a while to settle into goal pace. Aim for 10-15 seconds slower than your goal pace, and do not weave around other runners. The lateral movements will fatigue muscles you don’t normally use in running and weaving will add extra distance to your run. Let people pass you. Settle into a steady pace. You should have practiced your half marathon pace enough in training where you know how this pace will feel on race day. The pace should feel comfortable and sustainable. Don’t obsess over your watch; check in at your pace but trust yourself and trust your training. If you feel tempted to slow down or speed up too much at any point, focus on a few runners around you who are running your speed and pace with them. In How Bad Do You Want It?, Matt Fitzgerald describes the group effect as being how running with others reduces your perceived effort – thus making it easier to run faster than you would on your own. Take advantage of this effect if you find others running your goal pace. A half marathon will get hard at this point, but if you started out conservatively, you should still have fuel in your tank. Maintain your goal pace as best as you can or increase it by 5-10 seconds per mile if possible.This is when the race becomes a mental game: you will feel comfortable, but with the proper coping strategies you can run at this effort. This segment of the race is when you should try to pass other runners: focus on one runner, work towards passing them, and then repeat. Push your pace more and more – you are almost done and you are not about to crash and burn at this point (unless it is psychological). I like to count down by tenths of a mile from 12.1 and tell myself to push just a bit harder with each tenth that passes. Give your hardest effort over the final tenth. Focus on the mile you are in. Don’t worry about how you will feel in the next mile or at the end of the race. Don’t stare at your GPS instant pace (trees and skyscrapers can throw it off), but check in on your mile laps to determine if you are running on pace. Bad miles and good miles alike occur in a race. Don’t stress over a mile split that is too fast or too slow – simply correct course and focus on the next mile. Have you ever crashed and burned in a race? 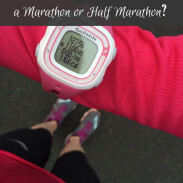 What tips do you have for half marathon pacing? I really struggle with the weaving early in a race. I think I often times end up starting too far back and cant go anywhere near my goal pace without weaving. I think I need to work on lining up more appropriately so that I don’t waste energy passing other runners! I generally do pretty well with pacing half marathons- its the 5ks that I go out too fast or to slow for!I guess with a half its a long enough race that I feel comfortable holding back a bit in the beginning. It does make a difference where you line up – especially in big races! I try to line up near the pacer for my goal time, although they usually go out faster. I haven’t run a 5K race but I can imagine the pacing is very hard with those! Race strategies! Write it down just like this so there’s no forgetting on race day. It took me years and years and years to learn to not start out too fast. Actually, truth be told, I STILL start out too fast. There’s just something about the adrenaline on race day that gives my legs the speedies! The adrenaline is certainly a powerful force on race day! I just wish it was there at mile 10/20 as much as it is at the start! Love these tips Laura! I have definitely crashed and burned more times than I care to count. Then, the last miles are such a painful struggle. It can be so hard to dial it back in the beginning. The best races I have run are ones where I dialed in my pace at the beginning perhaps on the slow side and then worked towards negative splits! Thank you! I think crashing and burning is a rite of passage for a distance runner – we’ve all been there! Negative splits are hard to run but so rewarding when we do. I have crashed and burned at a few races. Starting off too early thinking I can hold that pace, and later regret it. I lucked out during my last half with my friend pacing me and led me to a PR. Having a friend to set the pace is so helpful – that’s awesome how you had that support! I love that idea of you break it down by a tenth of a mile until the end! Totally going to try that in my next half. Checking out Sarah’s article on pacing now! Thank you! Let me know what you think of the strategy! Thank you so much for writing this post!! My last half marathon was a crash and burn….the last 5 or 6 miles were miserable because I started out too fast without even realizing it. I don’t want to make that mistake again, and as I have a 10 miler this weekend, I’ll remember your advice! Thank you! I’ve made the mistake as well of starting out too fast and it’s not fun. I hope your 10 miler goes well this weekend – good luck! This is a fantastic post and exactly what my coach tells me and what I tell my clients. Also, you’re so adorbs in your race pic. Look at that smile!! Any suggestions on trying to maintain an even pace during those middle miles? I don’t struggle so much starting out fast, but my pace isn’t as even as I’d like it to be in those middle miles. Training for my second and third half (one week apart), but have ran quite a few 10k’s. I even get 0.25mi updates from my running app just to try and keep tabs on my pace-it’s a pain, but I feel it’s the only way to have any idea. I would recommend doing lots of continuous tempo runs at half marathon in training to help you know what race pace feels like and know how to hold it for several miles. I’d also recommend trying to focus more on effort and getting the tabs on your pace less often – about every mile – since instant pace can vary and the 1/4 mile updates may cause you to surge or slow down, rather than settling in at the steady pace.